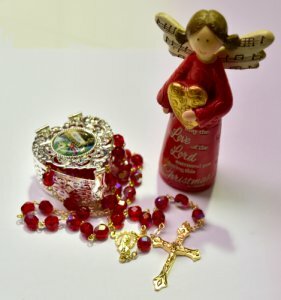 CATHOLIC GIFT SHOP LTD - Christmas Angel Gift Set with Rosary. Christmas Angel Gift Set with Rosary. Message angel gift set for Christmas. > Christmas message angel, "May the Love of the Lord surround you during this Christmas Season." Angel statue is 4 inch and made from resin.